I cannot think of a more beautiful or powerful expression of UJA’s mission to bring the community together than what took place last night, when almost two thousand members of Toronto’s Jewish community came together in an historic celebration of Toronto’s unbreakable bond with Israel. 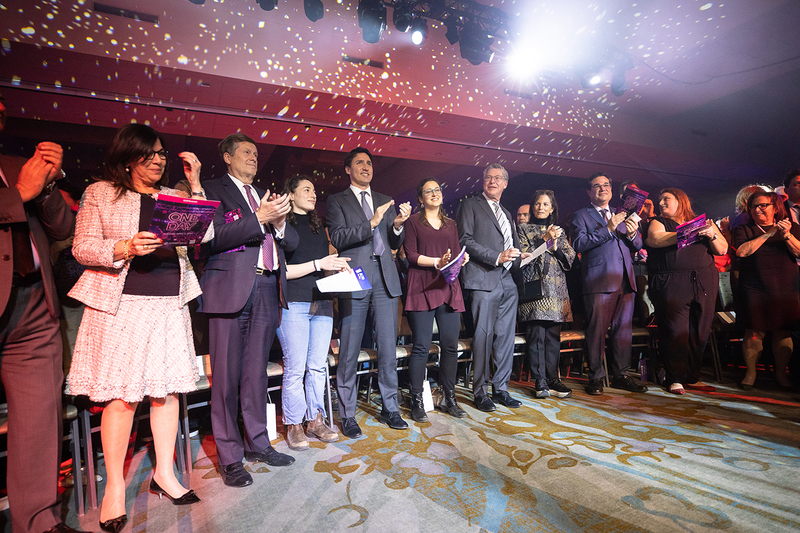 The event was organized in partnership between UJA Federation of Greater Toronto and Israel Bonds in honour of the official State visit of Israel’s President, Reuven Rivlin. While President Rivlin had to leave prior to the event to go back to Israel to be with his ailing wife, Nechama, I am sure he would have been overwhelmed by the outpouring of support, not only from the Jewish community but from Mayor John Tory, Prime Minister Justin Trudeau and numerous elected officials from all levels of government who joined us and lent their support to the President and the community. The evening featured an unforgettable community performance of the song “One Day”, an anthem of peace and unity, led by Israeli musical sensation Koolulam. It was truly awe-inspiring and emotional hearing almost two thousand unique and diverse voices from across the Jewish community converge as one. I am so proud and humbled to live in a city that has proven, time and again, that we can make amazing things happen when we unite in celebration of the values that we all share. No matter our differences, one of those values is the essential and central role that a strong Israel plays in our Jewish identity and in our Jewish future. UJA, through its passionate and dedicated donors, professionals, volunteers and lay leaders, has been a partner with Israel and its people since well before the founding of the State. Whatever the need, this community has always been there for Israel because the people of Toronto understand that our destiny as a thriving Jewish community is tied to theirs. Last night was a reaffirmation that when we are united around shared values, the results can be beautiful. This is our goal as a community organization. To unite people to create the kind of society that we can be proud of and that we want for today and the future. We have seen that unity often. We have seen it during times of antisemitism and hatred, like when we came together in the thousands in the aftermath of the horrendous terrorist attack at the Tree of Life synagogue in Pittsburgh or when we came together in solidarity with the Muslim community after the horrors of the mosque shootings in Christchurch. We see it when we unite to fight poverty and improve the wellbeing of those living in need in our community here and in vulnerable Jewish communities in Israel and around the world. And, we see it in times of celebration, like we did last night, with the community standing strong and demonstrating our love and passion for Israel. On behalf of everyone at UJA Federation, I want to thank you for uniting to make this such a great Jewish community.